Lady Houston: Nobody seems to be worrying much about our country these days. But, I'm doing my best to make them. Reginald J. Mitchell: Yes, so I see. Lady Houston: They won't believe me. But, I can see something. I can see England in danger. We've got to be strong on land and on sea. Reginald J. Mitchell: And in the air! Reginald J. Mitchell: And in the air. Lady Houston: Fiddlesticks. What can we do in the air except fly at ridiculous speeds? Besides it isn't natural to fly. We're not birds. Reginald J. Mitchell: You're not a fish; but, you've got a yacht. Lady Houston: That sounds rude. Leslie Howard, produced, directed and starred! 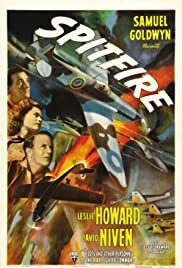 A fine movie biography about the designer of the World War II Spitfire. Strong performances are given by Mr. Howard and David Niven. Although it seems dated particularly with the black and white film, it is none the less worth your time to preview this movie. Leslie Howard was killed in an airplane crash shortly after finishing this film.